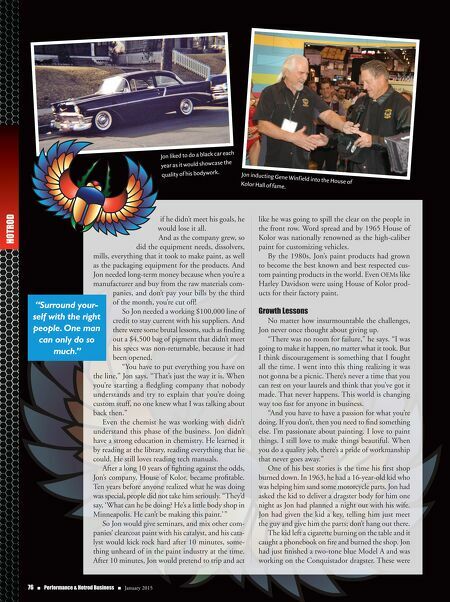 HOTROD 76 n Performance & Hotrod Business n January 2015 if he didn't meet his goals, he would lose it all. And as the company grew, so did the equipment needs, dissolvers, mills, everything that it took to make paint, as well as the packaging equipment for the products. And Jon needed long-term money because when you're a manufacturer and buy from the raw materials com- panies, and don't pay your bills by the third of the month, you're cut off! So Jon needed a working $100,000 line of credit to stay current with his suppliers. And there were some brutal lessons, such as finding out a $4,500 bag of pigment that didn't meet his specs was non-returnable, because it had been opened. "You have to put everything you have on the line," Jon says. "That's just the way it is. When you're starting a fledgling company that nobody understands and try to explain that you're doing custom stuff, no one knew what I was talking about back then." Even the chemist he was working with didn't understand this phase of the business. Jon didn't have a strong education in chemistry. He learned it by reading at the library, reading everything that he could. He still loves reading tech manuals. After a long 10 years of fighting against the odds, Jon's company, House of Kolor, became profitable. Ten years before anyone realized what he was doing was special, people did not take him seriously. "They'd say, 'What can he be doing? He's a little body shop in Minneapolis. He can't be making this paint.' " So Jon would give seminars, and mix other com- panies' clearcoat paint with his catalyst, and his cata- lyst would kick rock hard after 10 minutes, some- thing unheard of in the paint industry at the time. After 10 minutes, Jon would pretend to trip and act like he was going to spill the clear on the people in the front row. Word spread and by 1965 House of Kolor was nationally renowned as the high-caliber paint for customizing vehicles. By the 1980s, Jon's paint products had grown to become the best known and best respected cus- tom painting products in the world. 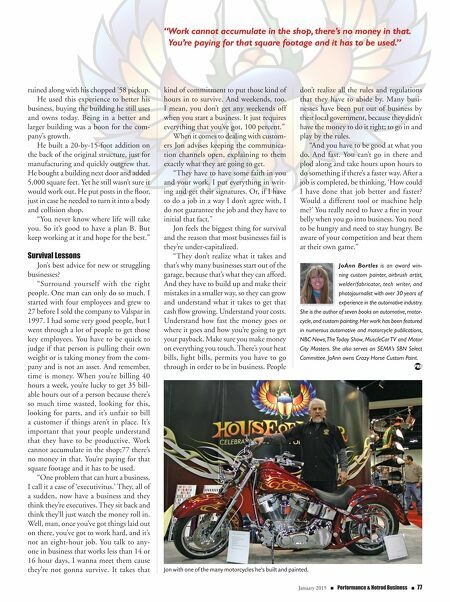 Even OEMs like Harley Davidson were using House of Kolor prod- ucts for their factory paint. Growth Lessons No matter how insurmountable the challenges, Jon never once thought about giving up. "There was no room for failure," he says. "I was going to make it happen, no matter what it took. But I think discouragement is something that I fought all the time. I went into this thing realizing it was not gonna be a picnic. There's never a time that you can rest on your laurels and think that you've got it made. That never happens. This world is changing way too fast for anyone in business. "And you have to have a passion for what you're doing. If you don't, then you need to find something else. I'm passionate about painting. I love to paint things. I still love to make things beautiful. When you do a quality job, there's a pride of workmanship that never goes away." One of his best stories is the time his first shop burned down. In 1963, he had a 16-year-old kid who was helping him sand some motorcycle parts. Jon had asked the kid to deliver a dragster body for him one night as Jon had planned a night out with his wife. Jon had given the kid a key, telling him just meet the guy and give him the parts; don't hang out there. The kid left a cigarette burning on the table and it caught a phonebook on fire and burned the shop. Jon had just finished a two-tone blue Model A and was working on the Conquistador dragster. These were Jon liked to do a black car each year as it would showcase the quality of his bodywork. Jon inducting Gene Winfield into the House of Kolor Hall of fame. "Surround your- self with the right people. One man can only do so much."